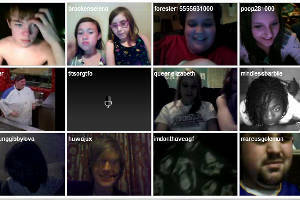 Chat with strangers all around the world in Tinychat. Meet new friends, teenage girls or confident young men! How to continue a relationship or friendship with people you meet on Tinychat. You met someone online and you really don’t want to stop talking to them? Does it feel like you two have some great potential to be more than just two people from different countries who accidentally stumbled on each other in a chat room? Or if this is simply just someone who feels nice and you don’t see why you two should stop talking? If it’s your first conversation with them on Tinychat, you’re messaging each other or even talking to girls or boys on video and getting along, you should attempt to do something so you don’t lose contact and can carry on another time as well. It’s nice to ask the person for their name, age, the country their from and where they live - even roughly, without naming the exact city or town. At least then you have some basic information about them. Knowing their name - and remembering it - is a nice thing to do. And naturally you do want to know stuff about them and this is the first step to doing so. You should find out if they’re feeling the same way about you or if they’re just looking for someone to have fun with and are not interested in keeping the relationship up outside of Tinychat. You can ask them for something that is more personal - like their Facebook info or for them to add you on Facebook, their Whatsapp number or another social media platform that you’re both using - and say that you think you can stay in touch. They can say no to that and this way you know where you’re standing - but they might say yes. If you got that info, it’s time to start thinking about what to do when this conversation is over. Making the first move - doesn’t matter if it’s a relationship or friendship we’re talking about - is not a crime. If you genuinely like them, don’t wait for them to message you first. It doesn’t have to be a dull text like ‘hey, how are you doing?’. Since you’ve talked already, you can message them a cool photo or video you found, or a longer and more specific message. Don’t forget to include a question or something that slightly urges them to respond. We don’t need to assume that they’re going to ghost you after giving you their Facebook name - and we’re not going to suggest that. But it might ease your anxiety concerning their response - you will feel better once they respond. And then talking will get easier. After that, it’s just like with everyone else you talk to online. Stay in touch, share things about your life, listen to what they are saying. But if you like them, it’s worth a try. At least you won’t regret not attempting to get to know them better.